Back in high school, I spent a considerable amount of time at Baker’s Square. If not scarfing down a piece of banana cream pie, I always ordered a chicken teriyaki pita. I’m not sure what it was about the dish, but that taste has always stuck in my mind. I’ve been thinking about it a lot lately, so I decided to create my own version of the throw back meal. Preheat oven to 400 degrees. In a skillet pan or wok, heat olive oil. Season chicken with salt and pepper and add to skillet. Cook chicken 3-4 minutes on each side. Add peppers, onion, carrots and garlic powder. Stir until vegetables soften, about 5-6 minutes. Meanwhile, lay pitas on a baking sheet. 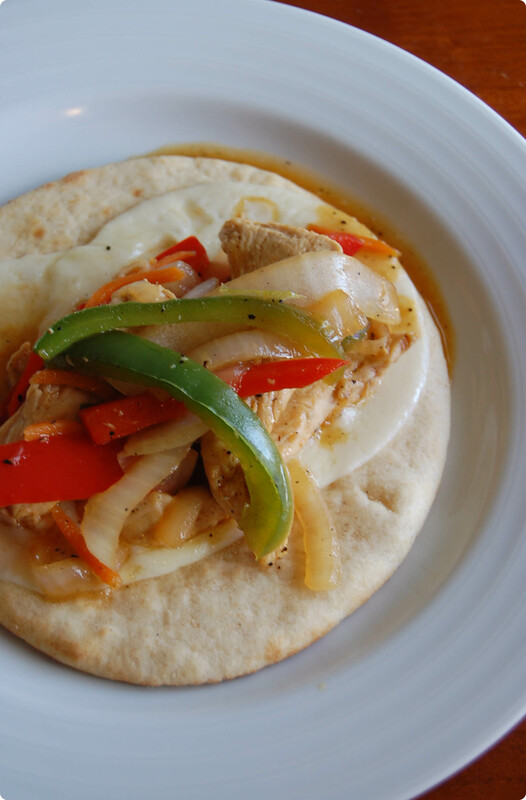 Place two pieces of provolone cheese on each pita. Bake for 5 minutes or until cheese is melty and bubbly. Add teriyaki sauce to pan, thoroughly coating all ingredients. Heat through, about 2 minutes. Salt and pepper to taste. 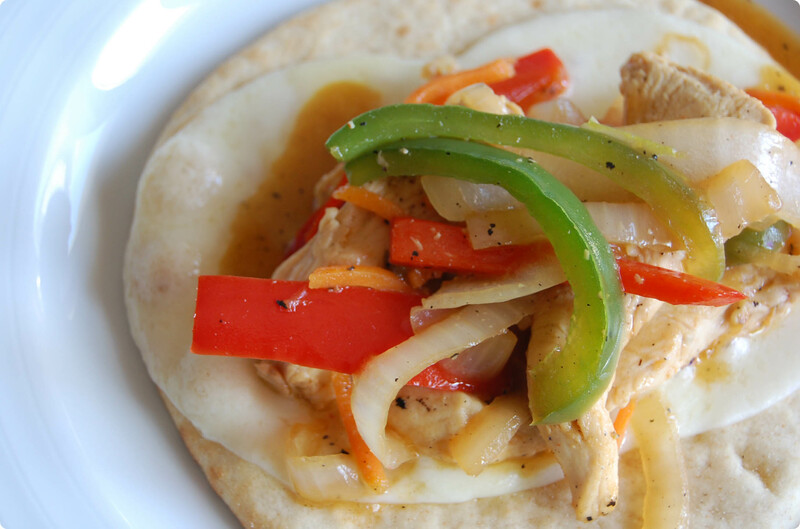 Spoon chicken and vegetable mixture on top of pita and serve. This meal is best eaten with a knife and fork, though I am sure you could make it work with hands only. I love anything teriyaki, even if it’s not an Asian related dish! This sounds fabulous and very cool that it’s one of those dishes that brings you down memory lane! This looks mouth-watering! I can’t wait to try it out! Thanks for the recipe! Awesome recipe, I’ll be making this on saturday. Thanks for sharing.